Marco Island, the largest of Southwest Florida's famous Ten Thousand Islands, lies directly south of Naples and just a few miles from the natural splendor of the Everglades. Each year, Marco Island homes for sale attract thousands looking for their own piece of the region's sun-washed beaches and sparkling waters. Inevitably, they've heard that it's a prime spot for hiking, boating, fishing, camping, or just taking it easy—and they're absolutely right! From awe-inspiring estates to beach-side cottages, Marco Island real estate caters to a broad range of desires and budgets, but it should be universally appealing to anyone looking to enjoy the relaxed lifestyle of Southwest Florida. If you're looking for a place to start a family, a place to retire, or anything in between, you'll find it here. Discover the unlimited appeal of Marco Island homes for sale, or browse our latest photographic listings of Southwest Florida real estate below. For access to our advanced search features, be sure to register with Key Real Estate. We've designed our search with people like you in mind. The real estate of Marco Island includes a huge variety of bungalows, townhouses, and luxury waterfront condos that can support any sized group of residents. 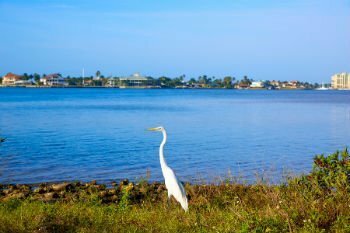 Depending on where you look, Sanibel Island homes for sale range from brand new builds to older homes sitting in some of the island's most sought-after locations. The luxury estates of Marco Island are truly something to behold. If money is no object, then you can have it all in Marco Island real estate, but even modestly affluent buyers will find astounding gems here. Higher-end houses typically provide unobstructed views of the Gulf, private beach access, private docks, and square feet enough to fit any sized party. Much like the rest of Marco Island homes for sale, though, there's so much variety that no two homes offer the exact same luxuries. As appealing as an afternoon dozing on the beach might sound, it's impossible not to be inspired into physical activity by Marco Island. Marco Island homes for sale make it easy to hit the water, explore the tropics of Collier Seminole State Park, or play a round or two of golf. Whether you're searching for seashells along the shoreline, heading into the Gulf of Mexico aboard a six-passenger catamaran, or watching for the flash of green light that hits the sky when the sun sets, you'll marvel at the relaxed-yet-active speed of island life. Don't let all that nature fool you, though, because Marco Island has many of the amenities you'd expect of a developed community, including more than 100 restaurants and shopping at the Marco Town Center Mall. If you're ever bored—and how could you be?—then Naples is just 30 minutes away on Highway 41, where you'll find even more great attractions and dining experiences. And for a longer daytrip, it only takes two hours via car or shuttle bus to get to all the culture and excitement of Miami. Contact Key Real Estate today for help finding your perfect piece of Marco Island real estate. We'd love to guide you to your dream home in the paradise of Southwest Florida.